The Kakuyids (also called Kakwayhids, Kakuwayhids or Kakuyah) (Persian: آل کاکویه‎‎) were a Daylamite dynasty that held power in western Persia, Jibal and Kurdistan (c. 1008–c. 1051). 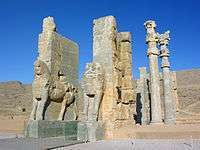 They later became atabegs (governors) of Yazd, Isfahan and Abarkuh from c. 1051 to 1141. They were related to the Buyids. Although the historian Margaretha states that the Kakuyids were of Kurdish origin, however, many other scholars consider them relatives of Sayyida Shirin, who was from the Dailamite Bavand dynasty. 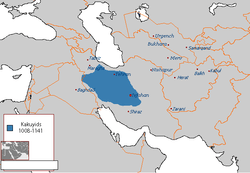 Encyclopædia Iranica also states that; “it should be remembered that “Kurd” in the sources of the 10th-11th centuries refers to all the transhumants of the Zagros region including the Lors.” According to historian James Boris, the word “Kurd” first became an ethnic identity in the 12th and 13th century. However, he further states that the term was even then also being used as a communal sense. The Kakuyids were given control of Isfahan in or before 1008 by Sayyida Shirin, who held the regencies of her young Buyid sons Majd al-Dawla of Ray and Shams al-Dawla of Hamadan. The man who was given the administration of the city was Muhammad ibn Rustam Dushmanziyar. Over time, he effectively became independent of Buyid control. At times Muhammad ibn Rustam Dushmanziyar acted as an ally of the Buyids; when Shams al-Dawla was faced with a revolt in Hamadan, for example, he turned to the Kakuyids for aid. Shortly after Shams al-Daula died, he was succeeded by Sama' al-Dawla, however, the Kakuyids invaded and took control of Hamadan in 1023 or 1024. They then moved on and seized Hulwan from the 'Annazids. The Buyid Musharrif al-Dawla, who ruled over Fars and Iraq, forced the Kakuyids to withdraw from Hulwan, but they retained Hamadan. Peace was made between the two sides, and a matrimonial alliance was eventually arranged. Muhammad ibn Rustam Dushmanziyar was succeeded in 1041 by his son Faramurz. While in Hamadan another Kakuyid, Garshasp I, took power. In 1095, Garshasp II became the new Emir of the Kakuyid dynasty, and was later killed at the Battle of Qatwan. Faramurz's reign was cut short by the Seljuks, who after a year-long siege of Isfahan took the city in 1051 or 1052. Despite this, Faramurz was given Yazd and Abarkuh in fief by the Seljuks. The Kakuyids remained the governors of these provinces until sometime in the mid-12th century; their rule during this time was known for the construction of mosques, canals and fortifications. Ali ibn Faramurz (1070's - 1095) - Yazd. Married Chaghri Beg's daughter, Arslan Khatun Khadija, in 1076-1077. ↑ The Political and Dynastic History of the Iranian World, C.E. Bosworth, The Cambridge History of Iran, Vol. 5, ed. J. A. Boyle, John Andrew Boyle, (Cambridge University Press, 1968), 37. ↑ Margaretha T. Heemskerk, Suffering in the Mu'tazilite theology, (Brill, 2000), 54. ↑ Huart 1993, p. 667-668. ↑ Bosworth 1993, pp. 359-362. 1 2 3 Kennedy 2004, p. 244. ↑ Madelung 1975, p. 217. ↑ Madelung 1984, pp. 747-753. ↑ Ch. Bürgel & R. Mottahedeh 1988, pp. 265-269. ↑ Bosworth, Clifford Edmund, Historic cities of the Islamic world, (BRILL, 2007), 562. ↑ Dailamīs in Central Iran: The Kākūyids of Jibāl and Yazd, C. E. Bosworth, Iran, Vol. 8, (1970), 86. Bosworth, C. E. (1968). "The Political and Dynastic History of the Iranian World (A.D. 1000–1217)". In Frye, R. N. The Cambridge History of Iran, Volume 5: The Saljuq and Mongol periods. Cambridge: Cambridge University Press. pp. 1–202. ISBN 0-521-06936-X. Janine and Dominique Sourdel, Historical Dictionary of Islam, Éd. PUF, ISBN 978-2-13-054536-1, article Kakuyids, pp. 452–453. Bosworth, C. Edmund (1998). "KĀKUYIDS". Encyclopaedia Iranica, Vol. XV, Fasc. 4. London et al. : C. Edmund Bosworth. pp. 359–362. Bosworth, C. Edmund (1984). "ʿALĀʾ-AL-DAWLA MOḤAMMAD". Encyclopaedia Iranica, Vol. XV, Fasc. 7. London et al. : C. Edmund Bosworth. pp. 773–774. Bosworth, C. Edmund (1983). "ABŪ MANṢŪR FARĀMARZ". Encyclopaedia Iranica, Vol. XV, Fasc. 3. London et al. : C. Edmund Bosworth. pp. 335–336. Madelung, W. (1984). "ĀL-E BĀVAND (BAVANDIDS)". Encyclopaedia Iranica, Vol. I, Fasc. 7. London u.a. : Routledge & Kegan Paul. pp. 747–753. ISBN 90-04-08114-3. Frye, R. N. (1986). "Bāwand". The Encyclopedia of Islam, New Edition, Volume I: A–B. Leiden and New York: BRILL. p. 1110. ISBN 90-04-08114-3. Bosworth, C. E. (1975). "The early Ghaznavids". In Frye, R. N. The Cambridge History of Iran, Volume 4: From the Arab Invasion to the Saljuqs. Cambridge: Cambridge University Press. pp. 162–198. ISBN 0-521-20093-8. Huart, CL. (1993). "Kākōyids". E.J. Brill's First Encyclopaedia of Islam, Volume IIII. Leiden: BRILL. pp. 667–668. ISBN 9789004097902. Meisami, Julie Scott (1999). Persian Historiography to the End of the Twelfth Century. Edinburgh University Press. pp. 1–319. ISBN 9780748612765.